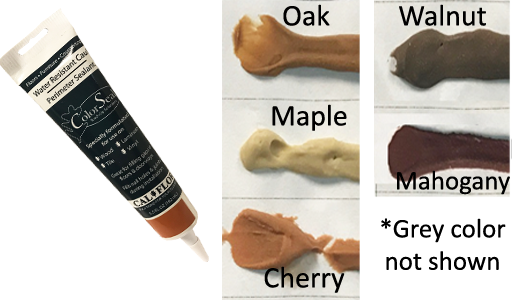 Cal-Flor brand ColorSeal touch-up solution is a versatile sealant that works as a floor gap filler and wood trim nail hole filler. It has been specifically created for the DYI market which means it is easy to use and non-toxic. The water-based acrylic latex blend is water and mildew resistant. This wood hole filler dries solid but stays flexible, so it can contact and expand with the flooring. There are six colors available, so you can find an exact match you need. This perimeter sealer is easy to use. Simply clean the surface, and apply a continuous bead of ColorSeal. No caulking gun needed! Press the wood hole filler firmly down on the surface. And remove excess sealant with a damp cloth. ColorSeal is a great additional to your toolbox. Buy today! Looking for repair products for carpet or grout? Check out our full selection of Floor Repair Products.